While most high school students are undoubtedly looking forward some time off from school, 14-year-old Gianna Chien is possibly saving lives. 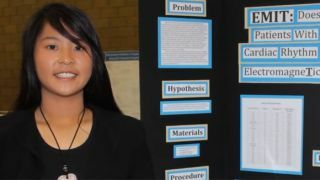 In March, Chien presented a science fair project that looked at whether the magnets inside the iPad 2 were capable of disrupting the magnets found in implanted defibrillators used by patients with heart trouble. Her study showed the 30 magnets (used to hold Smart Covers in place) inside second-gen iPads could potentially shut down devices used to restart patients' hearts, and implanted internally, accidentally. While she may not have won her Stockton, Calif. school's science fair (she finished 2nd), her work is now being looked at by the 8,000-plus attending doctors and researchers at this week's Heart Rhythm Society meeting. With help from her father (a cardiac electrophysiologist), Chien was able to conduct her study with 26 volunteers with defibrillators. When the tablet was placed on a subject's chest, the magnets activated in 30 percent of the trials, but didn't interfere with the pacemakers or loop-recorder that were also tested. Though some of the heart devices are built to turn back on once the magnets are no longer interfering, others need to be reactivated manually, or even have the same magnetic field applied again to restart. "I don't think anyone really knows about the risks," Chien told Bloomberg. For its part, Meditronics Inc., the leading manufacturer of defibrillators, said its own testing hadn't uncovered any risks in using the iPad in accordance with Apple's instructions, but did warn that placing any magnets near heart devices of this nature was ill-advised. Apple declined to make a statement on the matter, and instead offered that concerned consumers read the safety guidelines in the online product manual. To be fair, Apple does advise in those statements to keep the iPad at least six-inches away from heart devices, and also warns the tablets should be turned off entirely in healthcare facilities. Chien is tentatively thinking about expanding the tests to other electronic devices for next year's science fair, but seems more interested in raising awareness than academic accolades. "I definitely think people should be aware," Chien said. "That's why I'm presenting the study."